This how-to will help you with your initial setup on Fedora 21 so that you can successfully secure your server while giving you the peace of mind knowing your server is protected. With any server, the primary goal should always be security. Many users are victims of malicious infiltrations on their servers due to the lack of security boundaries established from the beginning. Let us begin on the right path by laying our foundation with security. You need a Fedora 21 server that is configured with a static IP address. If you do not have a server already, consider a cost-effective server from Atlantic.Net and be up in under 30 seconds. To get started, login to your Fedora 21 server via SSH or the VNC Console located here. Atlantic.Net Cloud servers are setup as minimal installations in order to avoid having unnecessary packages from being installed and never used. If some software packages that you’re used to using aren’t installed by default, feel free to install them as needed. By default, your Atlantic.Net servers are automatically set with secure passwords. However, we still recommend updating your password after creating your server and every 60-90 days after that to ensure it remains secure. A minimum of 8 characters, including lowercase, uppercase and numbers are recommended to increase the level of security. After successfully updating your password, it’s recommended that you create a new user with sudo/root permissions. Since the common admin user for many Linux Operating Systems like Fedora 21 is “root”, we’re going to make a new admin user that will be used for day-to-day administration tasks. Creating a new user with root permissions will increase the security in the way your server is accessed. Individuals looking to target your system are going to target the root user because it’s known the be the default admin account. By creating a new user with sudo/root permissions, and disabling the root user, you are increasing security by using a user that isn’t already publicly known. Type the following command to create your new user replacing “user1” with your own username and confirm. Once you have created a new user and created the password for that user, it is time to add the user to the sudo wheel group. In Fedora 21 once you add them to the sudo wheel group they are automatically assigned sudo/root permissions. Run the following command to add the user to the sudo wheel group. Finally when you have created the user with sudo/root permissions, you can exit your session and log back in with your “user1” to verify the changes that were made. Alternatively, you can run the following command and switch users from root to “user1” which will then ask you for that users password. In Linux systems, port 22 is the default port for remote connections via SSH. By changing the ssh port, you will increase the security of your server in preventing brute force attacks and unwanted users from reaching your server using the default port. For this tutorial, we will use Port 5022 as an example. Open your SSH Configuration file, find the Port line, remove the # and change 22 number to your Custom port Save and exit. In order for your system to update the settings from the SSH Configuration file, we must the restart sshd service. SSH has now been configured to use Port 5022, and if you attempt to login using Port 22, your login will fail. However, do not exit your session as we need to configure the custom port on the firewalls configuration part first, which we will configure in the upcoming steps. Since we’ve created a new user with root permissions and created a custom ssh port, there’s no need keep the actual root user available and vulnerable over SSH on your server. Let us restrict the root users access to be available on the local server and granting permission to the new user over SSH only. Open the SSH Configuration file, find the PermitRootLogin line, remove the # and change it from yes to no. In order for your system to update the new settings in the SSH Configuration file, we must restart the sshd service. Note: In making those changes you will now have the root user disabled so you must log into your server with the “user1” that you created. However, do not exit your session, we must configure the custom port on the firewall in the upcoming steps. Private/Public SSH Keys are great additional features that increase security in the method a server is accessed. However, it takes a bit more effort to setup. The question is, Is your server worth the extra security? If you would like to implement the following security features you can continue with the following steps. Let us proceed and generate the SSH Key. If you want to change the location where the SSH Key will be saved, you can specify it here. However, the default location where its stored should be OK. Press enter when you are prompted with the following question then enter a pass phrase, unless you don’t want one. Configuring the SSH Key is crucial, we must copy the full key string to a Word/ Notepad Document. The Key can be viewed in the following location with the cat command. Copy the SSH key beginning with ssh-rsa and ending with [email protected] into a Word/ Notepad document, so we can add it to the config file later on. Once the SSH Key is stored safely, the directory for the SSH Keys needs limited permissions that only the owner can read, write and execute the file. Paste the SSH Key then save and exit using the VI format. Finally, we have to limit the permissions of the authorized_keys file that we just created so only owner can read and write. We could now verify that the key is working by closing the session and typing [email protected] or your servers hostname in your SSH console . 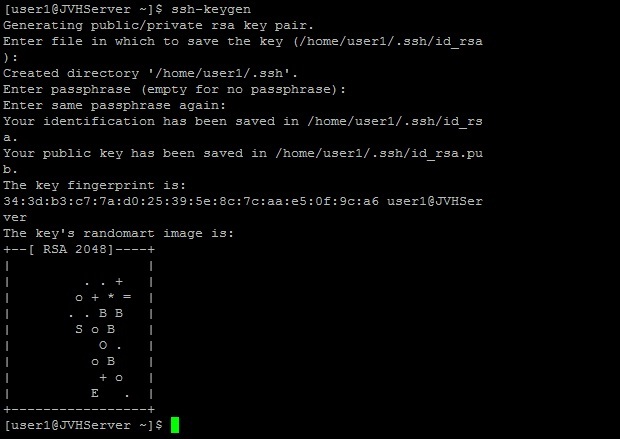 Furthermore, for more information you can click “here” to see our How To Generate and Use SSH Keys article. Next, we’re going to add a rule to allow the custom SSH Port 5022 that was created earlier so it can access the server publicly. At the same time, we’re going to remove the previous default rule allowing SSH access on TCP/22. If you have a web server, you may want to allow the following rules so your sites could be accessed over the internet. You can use this for similar rules related to any systems you want to be publicly accessible. This test server is setup to host a website and email services, so in addition to the updated SSH and HTTP(S) rules, additional rules for secure POP3, IMAP, and SMTP have been added. For Firewalld to accept those settings you must restart the firewall. Your settings will have been saved and you are ready to proceed. The NTP (Network Time Protocol) is used to synchronize the time and date of computers over the network in order to remain accurate and up to date. Let us begin by installing the NTP(If it hasn’t been installed) and configuring the service to synchronize with their servers. Once the NTP service is installed, we need to make sure that the service is ON. Now that the service has started lets enable the NTP server so that it will constantly update the server’s time from the NTP server. A Swap file is simply a small amount of space created on a servers hard drive to simulate RAM. In the event that the server is running low on memory it will look at the hard drive and ease the load tricking the system to think it has more memory. We will set up the swap file on the hard drive to increase the performance of the server just a little bit more. Begin by checking your resources to make sure we can add the file. When you run the following command, you will see the percentage space on your Hard drive that is currently being used. When creating a Swap file, usually you want to add half of your existing RAM up to 4GB(If you have 1GB of actual Ram then you add a 512MB file). In this part, I will be adding a 512MB swap file to the drive. The way that this is calculated is by 1024 x 512MB = 524288 block size. Now that we have added a swap file, a Swap file area needs to be created in order to proceed. With the Swap file created and the Swap file, area added we can go ahead and add permissions to the file so that only the owner can read and write. Now that the swap file has the appropriate permissions we can go ahead and activate the it. You can verify your newly added Swap file with the following. In order to make the Swap file always active even after a reboot, we must configure it accordingly. Paste the following command at the bottom of the file save your work and exit. With that, you now have a server with a strong security foundation that will give you the peace of mind knowing that your server is protected. You may now proceed to build your platform according to your needs. Thank you for following along and feel free to check back with us for further updates.